File extensions are vital because they tell your computer what programs can open a file. Normally, you don’t have to do much with them in Windows aside from setting your default programs How to Change Default Apps and Settings in Windows 10 Windows 10 makes a lot of decisions for the lazy user. If you would prefer to be your own master, you can set your own preferences. We show you how. Read More . However, sometimes you’ll find that a file extension doesn’t open in the right program. Or maybe you want to double-check what app is set as default for a certain type of file. Here’s a quick guide to managing and resetting file associations in Windows 10. 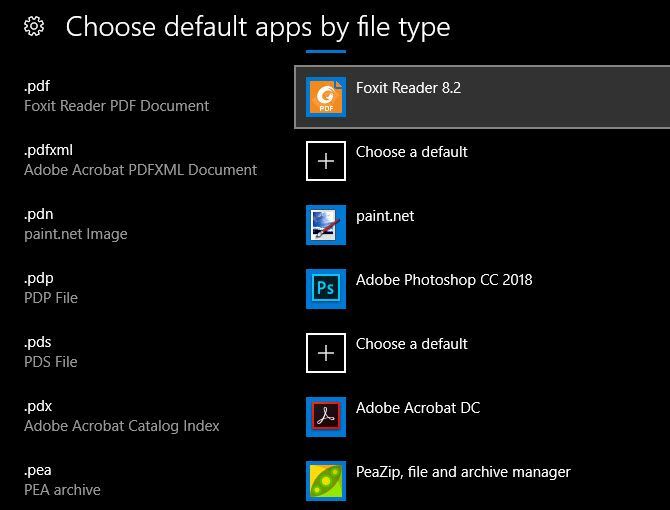 To look over the complete list of file associations, scroll down a bit and click Choose default apps by file type. This will let open a huge list of file extensions, many of which you’ve probably never heard of How To Open Strange File Types In Windows Computers know thousands of different file formats. Sometimes, both you and Windows are clueless as to how to open a strange file. Here is how you can figure out how to open those files. Read More . You can select any entry to change its associated program. Should you find that your file associations are completely messed up, you can click the Reset button to change everything back to the defaults. This includes Microsoft’s “recommendations”, so you’ll need to change your default browser back from Edge, as well as the other categories like photos, videos, and email. For more, see our complete guide on fixing file type associations How to Quickly Fix Windows File Type Associations Some tools have a bad habit of changing your default programs. They do that by changing file type associations. Windows 10 likes to mess with your preferences, too. Here’s how to have it your way. Read More .